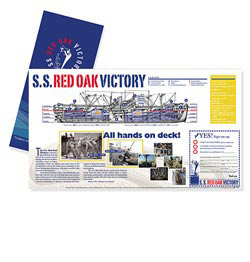 Named for an Iowa town that lost the highest number of GIs per capita in the United States during World War II, the S.S. Red Oak Victory is the only ship of its kind that is preserved at the site of its launching. It is a source of growing community pride and its logo is designed to capture the united spirit of a diverse cross-section of volunteers representing seamen, engineers, shipyard builders, World War II veterans, Merchant Mariners, historians and local residents—all of whom are working together to fully restore one of the last ships built by the Kaiser Shipyards in Richmond. 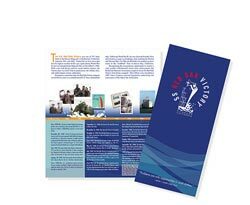 Identity standards are designed for volunteer use as well as for coordination with the Richmond Museum of History's own separate identity. Henry J. Kaiser's vision for prefabricated subassemblies and ingenious engineering concepts led to stunning achievements in shipbuilding that played a vital role in the outcome of World War II. The Richmond Shipyards (whose workers built the S.S. Red Oak Victory) were unmatched for their speed and efficiency. Kaiser's words still serve as timeless encouragement and inspiration for a brochure designed to enlist volunteers and financial supporters—"Problems are only opportunities in work clothes." 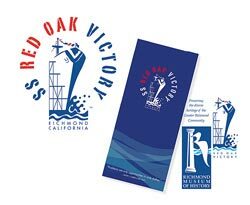 Facts, data, and drawings enrich the stories and memories of the many people drawn to the renovation of the S.S. Red Oak Victory. 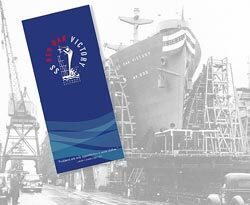 The brochure was designed to include detailed diagrams and legends of the ship's layout, technical engineering specifications, a sailor's journal notes, and a timeline to educate younger generations of local connections to historic world events. Attracting and welcoming volunteers is key to the successful renovation of the S.S. Red Oak Victory. Nostalgic photos (past and present) of life and equipment aboard ship generate enthusiastic response and interest in joining the restoration efforts.